The current climate of trade policy uncertainty is making it more important than ever for manufacturers to understand and plan for potential supply chain disruption according to a new report from PwC. The report, “The new US trade policy era: What it could mean for US manufacturers,” advises manufacturers to monitor the trade policy directions of the Trump administration and prepare for the effects of these policies may have on their supply chains in the next year and beyond. The report also asserts that the digital economy will disrupt established ways of doing business across borders. Some issues that are ripe for consideration in new trade agreements include updating customs-crossing rules for product as well as tackling rules for data flows and privacy, securing access for services and setting protections for investments and intellectual property. The report uncovers three areas of uncertainty that manufacturers need to address. As economies move toward value-added tax and seek to protect domestic jobs, breaking down exactly what is in the final product will become increasingly important. The report predicts US manufacturers could face increasing pressure to account for where parts originated. Manufacturers with a clear picture of of the origins and value of the content in their end-product will be better positioned positioned to reconfigure their supply chain to plan for potential disruption. Changes to NAFTA, for example, could bring shifts to cross-border supply chains. Looking for new suppliers in different jurisdictions to shift supplier networks closer to production for a “build where you sell” model may be advantageous for some manufacturers. Manufacturers should also engage in scenario planning on all countries with which US has existing trade agreements or where there may be new ones. 3. Getting ahead of trade policy: What’s my Plan B (or C)? 1) Building a trade-policy team that monitors prospective trade policy changes and anticipates possible supply chain impacts. 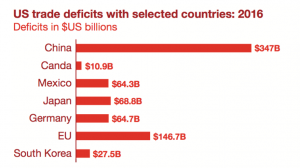 2) Identifying their biggest country exposures, including where the company has a significant amount of export into or import from, which countries with which the US has the highest deficits, and which ones could potentially have tariffs or other non-tariff measures imposed. 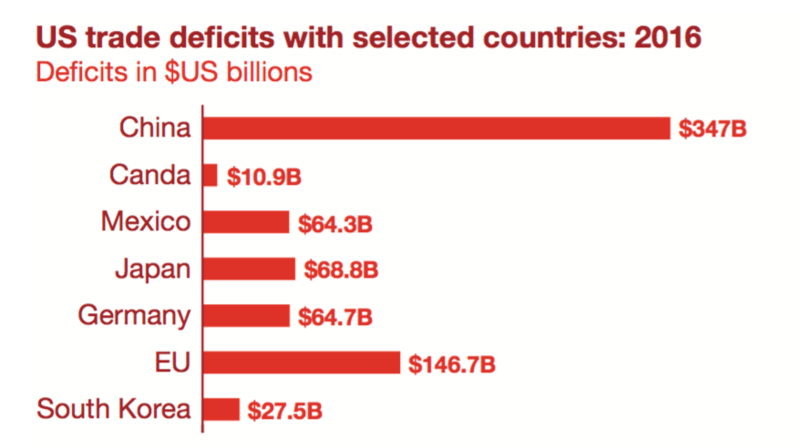 3) Alternative suppliers in countries with which the US currently does not have a trade deficit.